Here we’ll share the top five essential oils for skin handpicked by our in-house Aromatherapist, Gareth Despres. 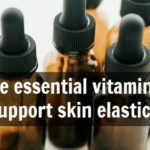 The triple benefits of using essential oils on the skin. 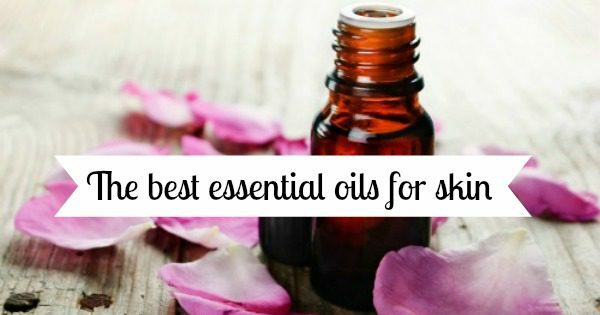 Our top five essential oils for skin, which skin types they are best for and why you should use them. Essential oils are natural plant extracts derived through various means (mainly distillation) from plants of all kinds for our enjoyment, health and wellbeing. As natural chemical compounds, they are made up of chemical constituents which possess wide-ranging therapeutic properties that work with our body to help it to heal, repair and regenerate as well as improve the general functions of organs and entire systems (see figures 1.0 – 1.1 below). When applied to the skin, essential oils have a triple beneficial action. Maintain general health and wellness and improve the general/overall function. Regenerate healthy skin cells quickly and efficiently. Enhance the barrier repair and protection functions, enabling it to more easily heal and repair itself from irritations and sensitivities, wounds, cuts, bites, stings, sores, and scars. Fight infections and kill potentially harmful microbes, stopping the spread of infection. Tighten and tone the skin tissue, bringing greater strength and elasticity. Soften and smooth, cleanse and clean, hydrate and moisturize, which improves the skin overall health and wellness as well as look and feel. Stimulate local blood circulation which encourages a glowing complexion. Fight free radicals, delay the signs of premature aging and soften fine lines and wrinkles. The molecules of essential oils are small enough to penetrate the semipermeable layers of the skin. When they do, either they are used by the skin cells themselves, or they pass through into the bloodstream where they are transported around our body to help maintain healthy functioning organs (eg heart, lungs, stomach, kidney, liver, etc) and systems (eg circulatory, respiratory, digestive, nervous, hormones, etc). affect changes; for example, they may stimulate or sedate the function of an organ or an entire system (see figures 1.0 and 1.1 below). This helps counteract stress, fear, tension, and worry, which, over time, place greater stress and strain on the body, its organs and systems. When all three actions are combined, essential oils demonstrate wonderful holistic healing powers where “healing the whole person” is considered to be more effective at reducing the strain, not just on our organs and systems, but also on the wider mind, body and spirit. 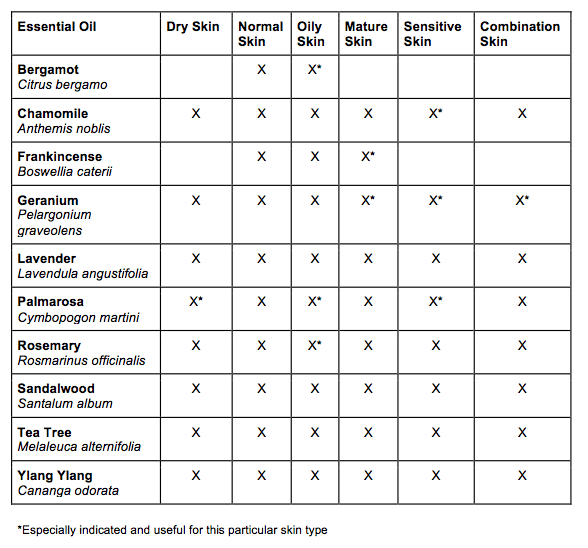 Let’s take a more detailed look at how essential oils feed, nurture and nourish our skin. 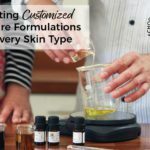 These oils have been chosen because of their effectiveness in skincare, ease of use, affordability and availability. Before using any of these oils do check the safety information at the end of this article. Fragrance: Fruity, fresh, green, sweet and zingy. Skin type best for: Normal and oily skin. 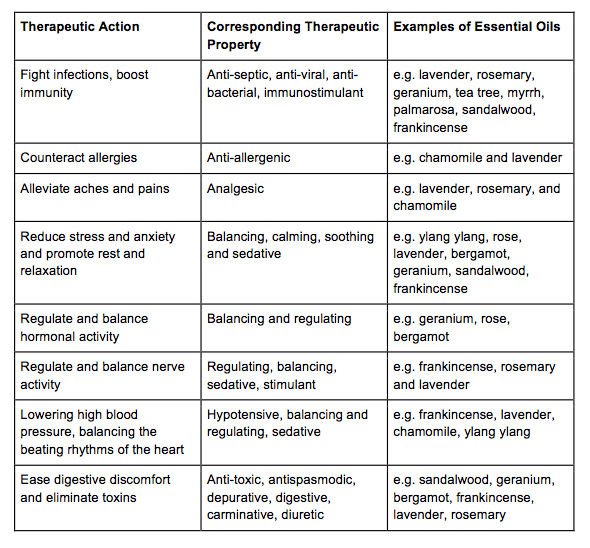 Therapeutic actions/benefits: Antiseptic, bactericidal, balancing, cicatrisant, deodorant, insecticide, vulnerary. Bergamot is a very useful skin care oil with its antiseptic and disinfectant properties, its fragrant quality, and its lightness of spirit. 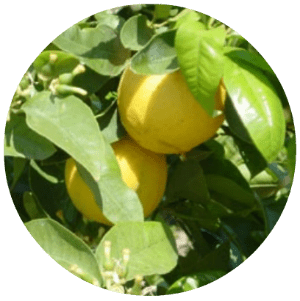 This makes bergamot a first choice for many treatments such as acne, spots, oily and infected skin as well as wonderful choice for facial beauty treatments. It is hydrating for the skin without being greasy and especially useful in the treatment of eczema. Bergamot FCF is best for the skin. 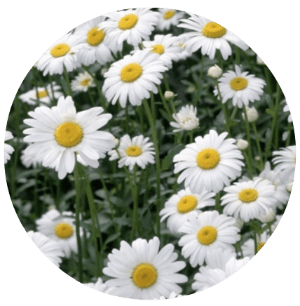 Fragrance: Roman Chamomile (Anthemis noblis) Sweet, herbaceous and warm aroma. German Chamomile (Matricaria chamomilla) Strong, pungent and herbaceous aroma. Skin type best for: All skin types, especially sensitive skin. 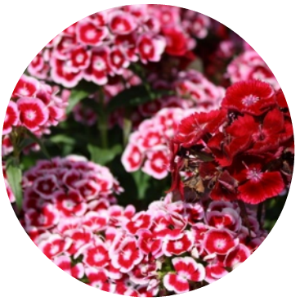 Therapeutic actions/benefits: Anti-inflammatory, anti-allergenic, cicatrisant, nervine sedative. 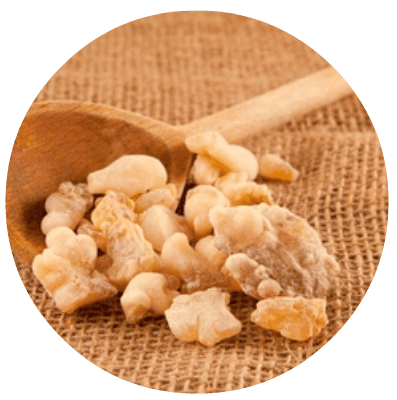 Excellent aid to preserve the skin (cicatrisant), combat irritations, inflammation, infections and allergies (anti-allergenic, anti-inflammatory), calms the nerves and promotes a sense of ease and rest. Skin type best for: All skin types, especially mature/aging, oily or acne-prone skin. 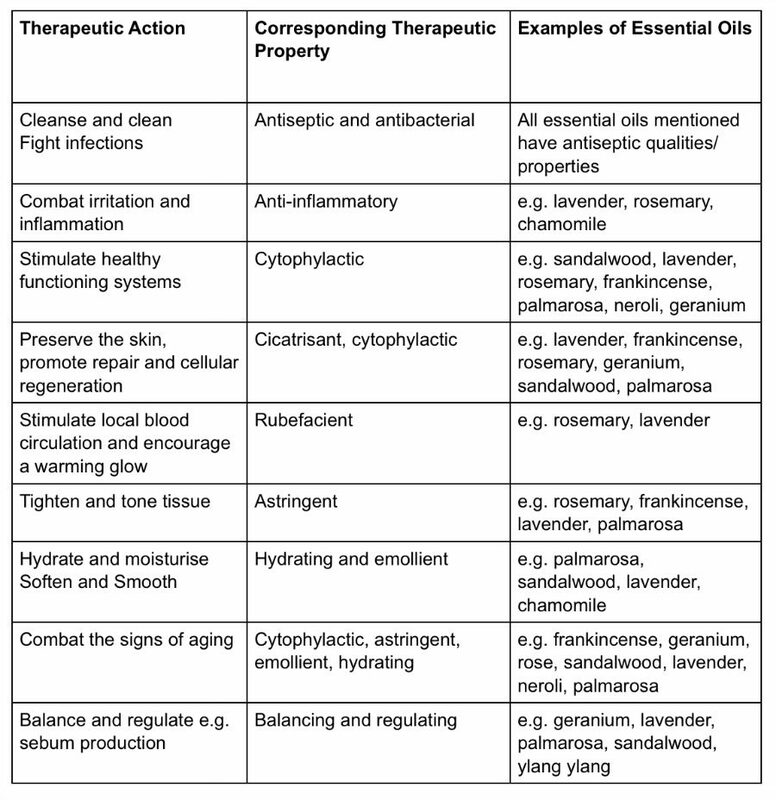 Therapeutic actions/benefits: Antiseptic, antibacterial, astringent, cicatrisant, cytophylactic, tonic, vulnerary. Helps to heal blemishes, cuts, wounds, burns and scar tissue (antiseptic, antibacterial, cicatrisant) and speeds up the process of healthy skin cell regeneration (cytophylactic). A favourite in anti-aging blends for this reason. 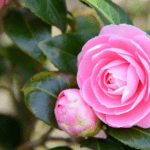 Fragrance: Pungent, strong, floral, sweet and much like rose. Skin type best for: All skin types, especially mature, sensitive and combination. Therapeutic actions/ benefits: Antiseptic, antibacterial, anti-inflammatory, astringent, balancing, cicatrisant, regulating, styptic. An agent that regulates hormones (regulating), balances sebum production (balancing), preserves the skin (cicatrisant), tightens and tones the tissue (astringent), cleanses and cleans the pores killing bacteria (antiseptic, antibacterial). Outstanding for oily and acne-prone skin, excellent also for dry skin and very useful for sensitive skin due to its regulating and balancing qualities. Fragrance: Sweet, herbaceous, well rounded, floral and earthy. 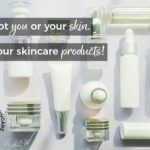 Skin type best for: All skin types. Therapeutic actions/ benefits: Antiseptic, anti-inflammatory, bactericidal, balancing, cicatrisant, cytophylactic, disinfectant, deodorant, fungicidal, hydrating, insecticide. Lavender works hard to heal wounds (antiseptic, vulnerary and disinfectant), has powerful skin-preserving qualities (cicatrisant), helps to repair damaged skin and speeds up the process of healthy skin cell regeneration (cytophylactic), kills bacteria, fights off infection, cleans and disinfects (antibacterial, anti-infectious, antiseptic, disinfectant), balances sebum production (balancing), encourages greater hydration (hydrating) regenerates affected areas and provides an uplifting as well as refreshing fragrance. Of course, this is just a useful starting place, once you become confident with these oils there are many more to explore too! 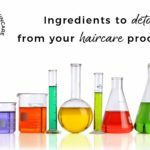 They must never be applied neat to the skin and must always be diluted in a carrier substance eg carrier/vegetable oil. They should be kept out of reach of children and pets and stored in a cool, dark and dry place. They should not be ingested and contact with the eyes must be avoided. They only need to be used (and should only ever be used) in very small amounts eg 1% – 2% – their potency is high so a little goes a long way and the more you use the greater the risk of irritation/sensitivity. Each essential oil carries some safety data called a contraindication which must be checked before use. At this point, it is also important to recognise that essential oils are not a substitute for conventional medical treatment and where symptoms exist and persist, a GP must be consulted. They do, however, complement conventional treatment extremely well and are used to great effect to ‘maintain’ and ‘improve’ healthy, happy and radiant skin, minds, bodies and spirits. Essential oils are a source from nature that possess extremely valuable therapeutic properties which help us to take responsibility for the maintenance and improvement of our own health and wellness, happiness and vitality. By using them not only do we get significant skincare benefits, but we also contribute to the health and wellness of the wider mind, body and spirit ie holistic health ‘treatment of the whole’, where the health and wellness of one affect the health and wellness of the whole. 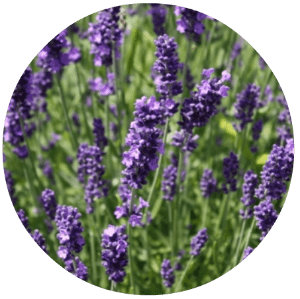 Using essential oils is also a hugely empowering and rewarding process because many are inexpensive, easy to obtain, readily available and, when you know which ones to work with as well as how, they are also very easy to use… and they smell divine! Post by Gareth Despres, IEB certified Aromatherapist and Director at the School of Natural Skincare.